GIFT CERTIFICATES: The personalized certificates can be purchased in $50, $100, $150, $200, $300 & $400 denomination and redeemed for any of our products. We have produced over 20 videos on the subject of growing giant pumpkins. Many veteran growers have our entire library. Here is a chance for newer growers or those just starting out, to get 3 of our most popular DVDs for 1 special price! You get 3 of our most popular DVDs. 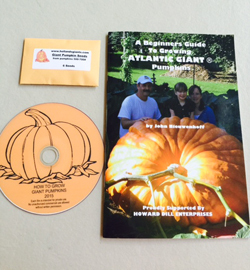 Each DVD contains a wealth of knowledge gained from 40-years of growing giant pumpkins, learn techniques we have used in growing over 100 pumpkins weighing 1,000 pounds or more, including the 2,363-pound World Record Champion Pumpkin of 2017. Each DVD is approximately 1 hour in length. Fish Meal + Free DVD! “GIANT PUMPKIN PLANTS LOVE FISH” 100% organic nitrogen source with 4% Natural Phosphorous and 6% Calcium. Broadcast 4 to 5 pounds per site in an 8 to 10 foot circle to get your plants off to a super start. Fish Meal is great for the whole garden, especially heavy-feeders like corn. Also works great on flowers, fruit trees and shrubs. Application rate is 1 to 2 pounds per 100 square ft.
Plus you get a FREE "How To Grow Giant Pumpkins" DVD! This is a wonderful mix of 50% Winter Rye, 40% Winter Oats and 10% Hardy Vetch! The Rye and Oats produce tremendous organic matter and the Vetch is a legume that fixes Nitrogen from the air into the soil for free! Winter Oats help suppress harmful Nematodes in the soil. Sow 7 to 10-pounds per 1,000-square feet. 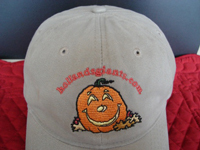 Adjustable beige hat with colorful giant pumpkin logo.